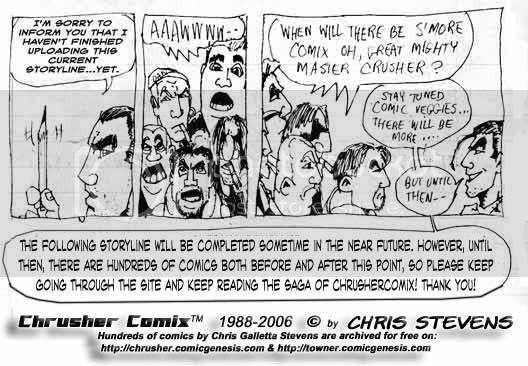 #3 - RotC #3: RaYzor's Funeral - "Return of the Chrusher #3 – Original Version (1994-95)"
When the comics got past high school, they started to add some more mature... even adult elements. It just went PG-13 to R, son. Detail went up considerably, as well. Chrusher returns home to find that his best-buddy/lackey RaYzor is dead. Shot by new agents of The Welforce. At RaYzor's wake, old and new characters collide and in the process, old storylines are finally resolved to wrap up the third chapter in "The Return of The Crusher" Trilogy. This issue is only available only via Pay-per-view basis or in print, but a short preview is available.